With the early kick-off, I was torn on whether to drive or take the train to the game. I decided on the latter option meaning that I left home rather early to give myself plenty of time to get to Watford. Contrary to what we had heard on our last visit, they made a late decision to open the West Herts before the game, but I was glad I had left the car at home as I arrived to see that the football matches going on at the sports club meant that the car park was already full soon after 10:30. It also allowed me to have the breakfast of kings, a pint and a hot dog, to set me up for the day. As we walked to the ground, there were touts galore in Vicarage Road most of whom appeared to be trying to buy tickets to sell on. There were also the eponymous half and half scarves on sale, one hawker was actually standing outside the Hornet Shop, which was ridiculous. I can’t believe that they weren’t cleared out of there. Team news was just the one change from the West Ham game as a slight injury to Kaboul meant that Prödl was drafted in to take his place. So, the starting line-up was Gomes; Cathcart, Prödl, Britos; Janmaat, Pereyra, Behrami, Capoue, Holebas; Deeney and Ighalo. For the visitors, Watford Academy graduate, Ashley Young, was on the bench. I am still trying to come to terms with the fact that little Ashley is in his thirties. Where did all those years go? When I took my seat I was a little perturbed to see a stranger in the seat next to me. I am always wary at a game against a ‘big club’ when I see a new face, especially if they are not wearing colours, but he had the season ticket of the guy who usually sits there and it was quickly apparent that he was a fellow Hornet. As the teams came out, our view was obscured as the 1881 flag with the angry moose made its way up the stand over our heads, a wonderful sight for the television cameras. Prior to kick-off the guy who sits behind me said that he thought it would be 2-1 today … to us. As always, I didn’t share his confidence, but he wasn’t the first Watford fan who had predicted a victory and United’s recent form did not bode well for them. The home side started the game very brightly and had a great chance to take the lead in the ninth minute when a free-kick from Holebas was headed on by Prödl, Deeney slid in to try to meet the ball and only just missed connecting. 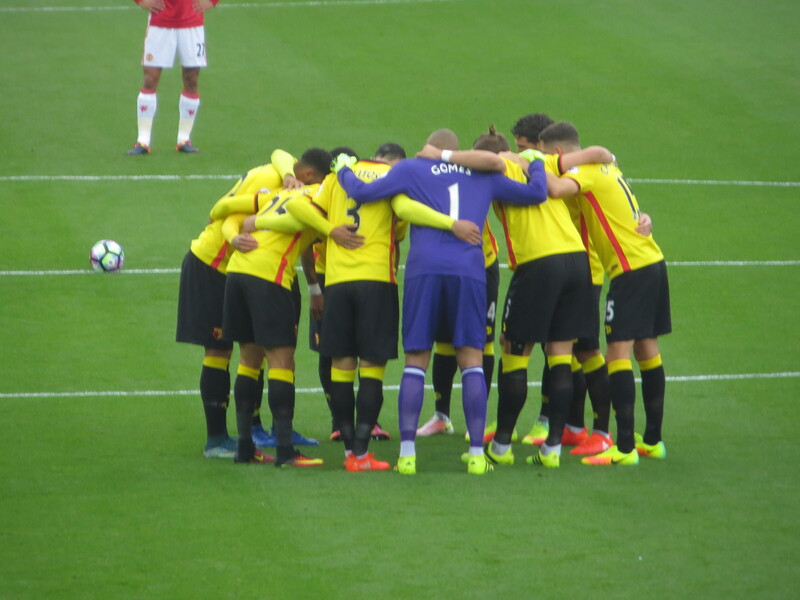 There was an even better chance a couple of minutes later, as De Gea collided with a team mate and the ball dropped to Ighalo who appeared to have the goal at his mercy but hit it wide leaving the Watford fans with heads in hands. To be fair to him, the replay showed De Gea was in a much better position than was originally apparent, but you get so few chances in games like this that any miss from a decent position causes concern. The attacking threat continued for the Hornets as a deep cross from Janmaat was met with a header from Deeney that was kept out by a wonderful flying save from De Gea. 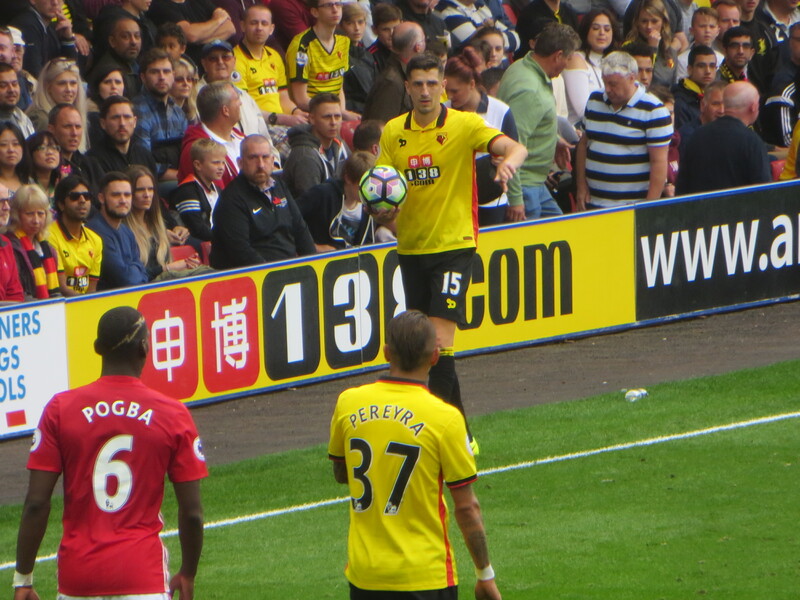 Soon after, a cross from Cathcart was met with a header from Ighalo that flew over the bar. The first real chance for the visitors came in the 20th minute when a Rashford cross was met by Ibrahimovic who directed his shot into the side netting. There was an extended break in play following a collision between Martial and Janmaat. First impressions were that Martial could have been badly hurt as he was flat on his back and didn’t move for some time. There was less concern for Janmaat who had walked to the edge of the pitch with his hand clutched to his head. It looked worrying for a while but, thankfully, both players were soon fit to restart the game. Just before the half hour there was action in the row in front as the bloke who usually goes for coffee in the 41st minute made an early move. There were meaningful glances all around as the inhabitants of the centre of the Rookery came to terms with this drastic change to usual practice. Early kick-offs have a lot to answer for. On the half hour, neither Gomes nor those behind the goal in the Rookery were particularly concerned when Pogba hit a shot from distance as it appeared to be flying well over the bar, so I nearly had a seizure when the ball smacked back off the crossbar. 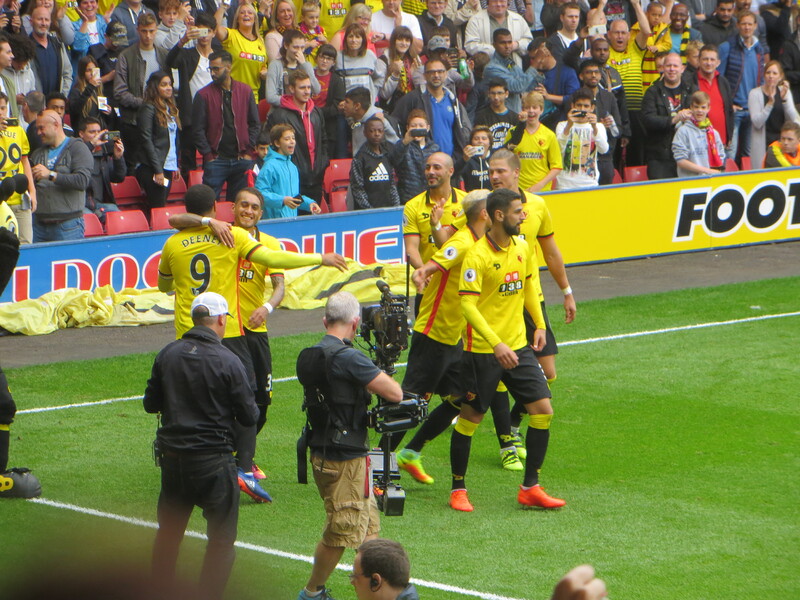 A bundled celebration for Capoue’s goal. Watford took the lead in the 34th minute. Martial was dispossessed by a robust tackle by Britos, United appeals for a foul were waved away, the ball fell to Janmaat who played it back to Capoue who powered his shot in off De Gea. Martial had remained on the ground as the goal was scored and, after finally receiving treatment, was unable to continue so was replaced by Ashley Young whose appearance was applauded by fans on all sides of the ground. A rare mistake from Behrami allowed Ibrahimovic to break forward but the danger was snuffed out by a brilliant challenge by Prödl. Just before half time, Capoue was fouled on the edge of the box. Holebas stepped up to take the free kick, his shot went through the wall but was saved by De Gea. In time added on, a bit of pinball following a tackle led to a lucky break for the visitors but Rashford’s run was stopped by another great tackle from Prödl. So Watford went into the break a goal to the good. It was a thoroughly deserved lead which should have been larger. At half time it was lovely to see Kenny Jackett and Robert Page having a chat with Emma Saunders and making the 50-50 draw. Both players are much loved by the Watford faithful and it was good to hear how impressed they were with the changes at Vicarage Road, both on and off the pitch. The draw was followed by the schools’ penalty competition. The perception that they had started rather late was confirmed when Troy and the lads appeared for the second half as the shoot-out reached sudden death. Thankfully one of the kids hit a winner before the TV directors had to intervene. In the first minute of the second half, a defensive header fell to Ibrahimovic who shot well wide of the target. Mazzarri made his first substitution in the 50th minute bringing Amrabat on to replace the injured Janmaat. There had been little in the way of chances in the first quarter hour of the second half but suddenly, out of nothing, the Watford defence failed to clear a cross from Ibrahimovic and Rashford finished past Gomes. I’d spotted a bloke in the Lower GT wearing a Man Utd shirt and scarf, he was looking very smug at this point. Watford tried to hit back immediately as a free kick from Capoue was cleared to Holebas whose shot was just wide of the target. For the next ten minutes, there was constant pressure from the visitors, but they didn’t manage a shot to test Gomes and the next chance fell to the home side as a Holebas free kick was met with a clever flick from Pereyra, but the United defence was able to clear. Up until the 75th minute, Michael Oliver had been pretty good in letting the play flow but, suddenly he seemed to be giving soft free kicks and, with this period of the game being played primarily in the Watford half, they mostly went to United. With ten minutes to go, it looked as though the visitors had taken the lead as a brilliant header from Ibrahimovic was flying in until Gomes appeared out of nowhere to make an equally brilliant save. It looked as though we would be hanging on until Deeney put in a great tackle on the wing which sparked a change in the momentum of the game. While the tackle was trivial in the context of the game, something about his energy seemed to inject new life into his team mates. Mazzarri’s second change saw Zúñiga on for Capoue who went off to rapturous applause. The Colombian’s first touch proved to be decisive. 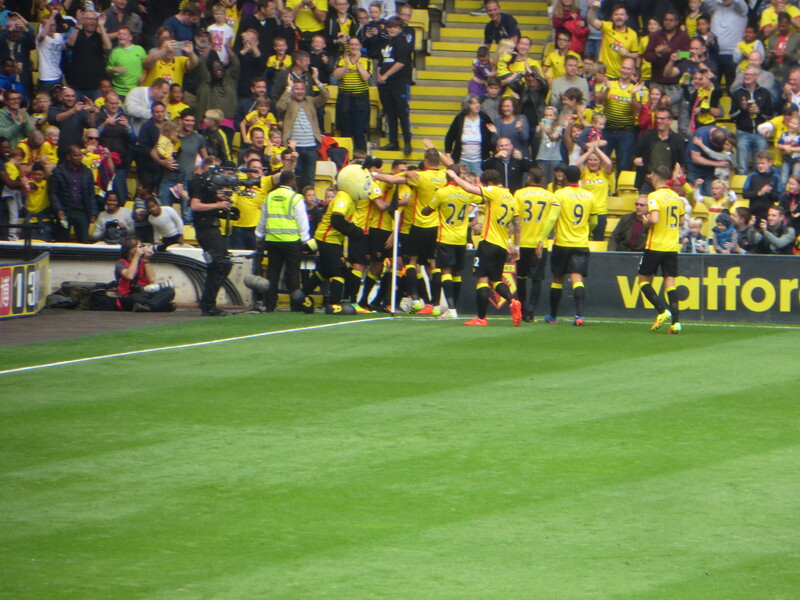 Amrabat played a lovely through ball to Pereyra, he cut the ball back to Zúñiga who powered into the net and went on a run with a celebration as passionate as any in the Rookery. 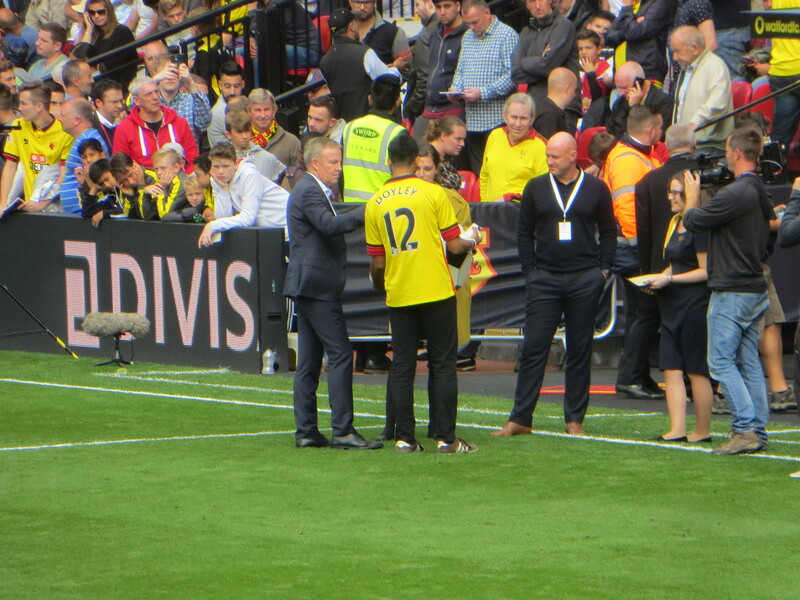 Watford’s final substitution came as the clock reached 90 minutes and saw Success come on for Ighalo who, as is his wont, politely shook the referee’s hand before leaving the field. The Hornets indulged in some time wasting at this point, winning a couple of corners and taking them short to keep the ball by the corner flag. Rooney was getting increasingly irate at this tactic, so the second time we did it, he just kicked Pereyra conceding a free kick and earning himself a yellow card. Highly amusing. The ball didn’t stay in that corner, though, and there was time for some icing on the cake as Success went on a run down the left before playing the ball to Zúñiga in the box, who was taken down by Fellaini. The appointment of Michael Oliver as referee had attracted some comment before the game including a poll by From the Rookery End on when he would award Man Utd’s first penalty in which ‘pre-match warm up’ attracted 57% of the vote. To be fair to him, I thought his performance was excellent on the day and not just because he went against tradition in awarding an injury time penalty against United. Deeney had to wait to take the spot kick as Zúñiga was down injured, his team mates, having come up to congratulate him on winning the penalty, had offered the poor lad very little in the way of sympathy for his pain. When the Colombian was back on his feet, Deeney kissed the match ball, placed it on the penalty spot and powered it down the middle beating De Gea and sending the Watford fans into delirium. Soon after the final whistle went prompting further great celebrations. As we left the ground, we passed Gino Pozzo. Our Cate shook his hand and thanked him for all that he has done for the club and was rewarded with a warm smile. She then spotted Glyn Evans, who is a former colleague of hers, so gave him a kiss. I asked whether she had noticed the bloke behind Glyn, but she had been so busy greeting her old friend that she didn’t spot Bobby Charlton. My friend, Toddy, had been unable to get to the game being held captive at Watford General after a routine op. So I popped in to share the post-match celebrations with him to be told that the commentary that he’d been listening to had been lagging behind the noise from the ground so he and his pal in the bed opposite would hear a cheer and then have to wait to hear the details. The tension hadn’t done either of them any good in aiding recovery. It was then back to the West Herts to join the rest of our crew for the analysis of the game. 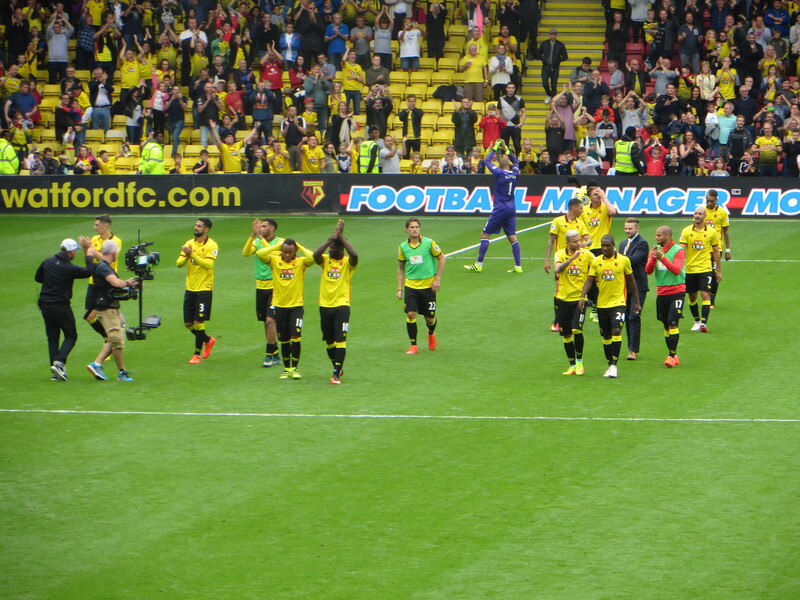 There were broad smiles on the faces of all the Watford fans we encountered. All agreed that this had been a consummate performance and a well deserved win. While it seems unfair to single out any one player, I have to say that Prödl was absolutely magnificent keeping Ibrahimovic quiet for most of the game. 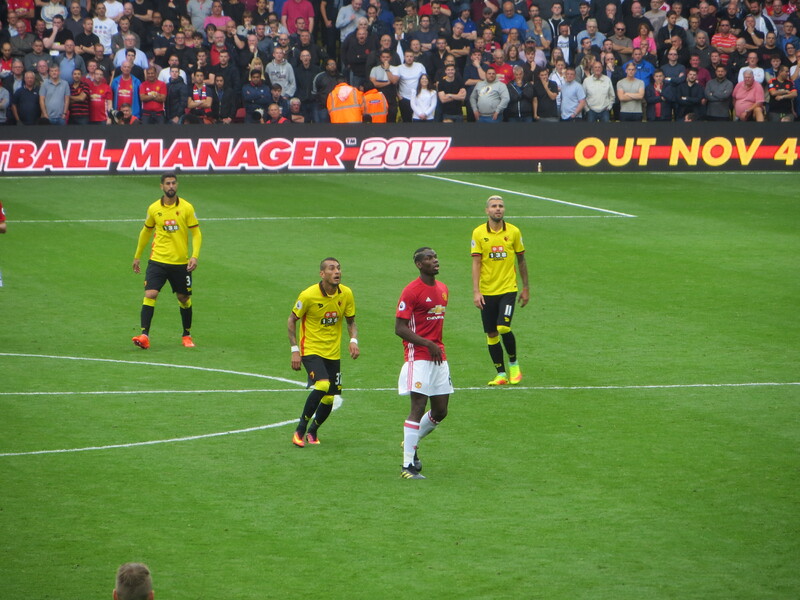 Pogba was almost invisible and, apart from a spell in the second half after United scored, Watford had been on top. My only concern had been that we missed Janmaat when he went off, as Amrabat does not have his defensive abilities, but he more than made up for it with the magnificent pass for the second goal. It is beginning to feel as though we have entered a new era. At the end of the Liverpool game last season, I was in tears as I never thought my niece would see a performance like that. Now she is getting rather used to it. When the fixture list came out I thought that it was quite possible that we would have no points on the board after the first five games. To reach this stage with seven points and a team that is looking better each week is just wonderful. Apart from the first half against Arsenal we have looked at least the equals of all our opponents this season and even a pessimist like me is starting to think that we now have a team that can compete with anyone in this division. It feels like the 80s all over again and I never thought I would be able to say that. Now let’s just see if they can do it on a wet Monday night in Burnley. 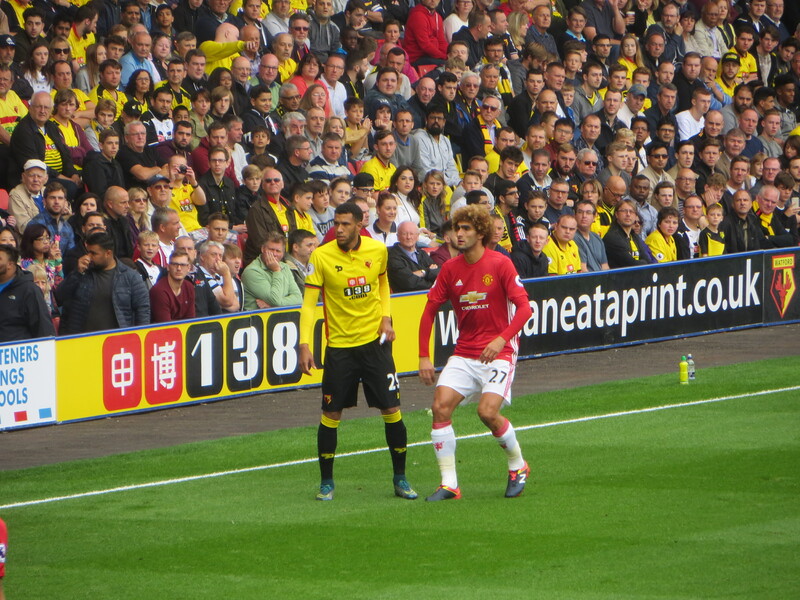 This entry was posted in Watford FC and tagged Anthony Martial, Antonio Valencia, Ashley Young, Chris Smalling, Craig Cathcart, Daryl Janmaat, David de Gea, Eric Bailly, Etienne Capoue, Heurelho Gomes, Isaac Success, Jose Holebas, Jose Mourinho, Juan Camilo Zuniga, Juan Mata, Luke Shaw, Manchester United FC, Marcus Rashford, Marouane Fellaini, Memphis Depay, Miguel Britos, Nordin Amrabat, Odion Ighalo, Paul Pogba, Roberto Pereyra, Sebastian Prodl, Troy Deeney, Valon Behrami, Walter Mazzarri, Watford FC, Wayne Rooney, Zlatan Ibrahimovic on September 19, 2016 by franelynn.